The raffle is open from the date of publication of these rules. Ticket will be available for purchase until 7pm on Saturday the 13th of October, 2018. Tickets are $5 each. 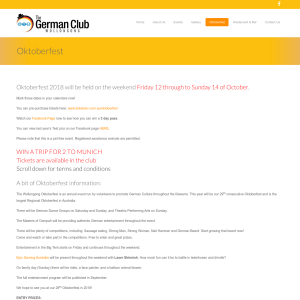 All proceeds go towards funding of AGA Club Germania including the running of the Oktoberfest. The winning entry will be drawn at the Wollongong Oktoberfest at 8pm on Saturday the 13th of October, 2018. 1.1 There is one (1) Prize to be awarded to one (1) Australian resident (Prize Winner). (Prize). The prize must be redeemed in full within 12 months of the Prize draw. The booking of travel must be at least 3 months in advance of travel. 1.3 The Prize includes two (2) return economy class airfare, Sydney to Munich, with an airline of AGA Club Germania’s choice. 1.4 The Prize includes three (3) nights accommodation for two (2) persons in a three star hotel of AGA Club Germania’s choice in Munich. 1.5 The Prize includes $500 (Australian Dollars) spending money. The spending money will be transferred to the Prize Winner 7 days prior to travel. 1.6 The Prize is limited to those things listed in clauses 1.1 thru 1.5, and does not include (without limitation) insurance, transfers from the Prize Winner’s place of residence to the Australian airport, travel between the Hotel and Munich airport, meals, incidentals, the return trip from the Australian airport to the Prize Winner’s place of residence, or the costs involved in acquiring the required travel documents such as passports or visas, which will each be the Prize Winner’s responsibility and at their expense. if the Hotel has a free shuttle service, this will be arranged. 1.7 The Prize Winner has the ability to extend the stated travel period above. The AGA Club Germania will not be responsible or liable for any additional costs involved if the Prize Winner extends the period stated above. Any costs associated with an extended stay either prior to or post the agreed dates will be at the expense of the Prize Winner, this includes but is not limited to flight changes, accommodation and food outside of the prize period. 1.8 All taxes (excluding GST) which may be payable as a consequence of receiving the Prize are the sole responsibility of the winner. 1.9 If the Prize Winner is not present at the draw, The Prize Winner will be notified of their Prize AGA Club Germania within 48 hours of draw via telephone. The winning ticket number and Prize winner’s name will also be published on the AGA Club Germania’s Facebook Page. 1.10 Cash refunding of the Prize is not possible. 1.11 The Prize is not transferable. AGA Club Germania, AGA Club Germania may substitute the Prize (or the relevant part of the Prize) with a Prize of equal or greater value. 2.1 For advertising purposes, AGA Club Germania may distribute and make public in print media and online, photos taken by employees or agents of AGA Club Germania in the context of the Prize and associated local events. The Prize Winner consents to the publication, adaptation or editing of the photos. 2.2 AGA Club Germania may also make public the above information and materials (such as photos) in a press release. 2.3 Consent is without limitation of place and content, and is not limited by time. 3.1 The result of the raffle draw is final and binding and no correspondence will be entered into. Entries will be deemed void if illegitimate, forged, manipulated or tampered with in any way. 3.2 Directors, Staff, Volunteers and their families are ineligible to enter. 3.3 Total value of trip (airfares, accommodation and spending money) is limited to $4,500. 3.4 Cannot be taken in peak European times (Summer vacation, Oktoberfest, etc.) unless the value of the airfares and accommodation is no more than $4,000. 3.5 Winner can vary flight dates to extend the holiday. Additional accommodation and costs are at the winner’s expense.